This is our general Australian KGVI definitive stamps range, for commemorative stamps click here or for more Specialist Australian KGVI stamps, including varieties and blocks, click here. 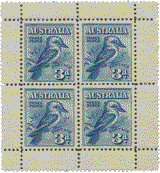 Prices shown in the listings are generally for mounted (hinged) mint stamps. Click on individual items for a full range of prices for different conditions including used.